While the nation’s schools continue to struggle to retain teachers, many Mary Lou Fulton Teachers College alumni are finding reasons to stay, advancing their careers and finding joy in classrooms. Why do teachers quit? Besides the obvious — inadequate pay, lack of respect — teachers have often said their jobs can be rigid, repetitious, isolating and lacking in creativity. It makes it difficult to even get to the three-year mark — a crucial milestone where only 50 percent of all Arizona teachers decide to remain in the professionThis figure is from a December 2017 report from the Arizona School Personnel Administrators Association. .
Arizona State University’s Mary Lou Fulton Teachers College recognizes this and is working alongside many school districts to redesign the workforce to reinvigorate the profession and make it more attractive. In February, MLFTC publicly unveiled its strategic initiatives at an event called “Education by Design: Innovation With Purpose in Schools and Systems” at the Phoenix Art Museum in front of 200 constituents. It was there that the college’s dean, Carole G. Basile, announced that she sees hope in future students and educators who want the freedom to think and act creatively as individuals and in teams. Basile often speaks of “creative intrapreneurs” to describe people who innovate from within professions or institutions, find new ways to push forward their organization and fields and take risks, looking beyond traditional boundaries. Some of those cutting-edge instructors have already graduated through the MLFTC programs and are putting the skills they’ve learned there to work: Josh Meibos, a physical education instructor at Crockett Elementary; Rachel Manak, a sixth-grade teacher at Kyrene Centennial Middle School; and Angelina Cook, a kindergarten teacher at Eagle Ridge Elementary. Josh Meibos had it made. Nearly a decade ago he was living in Hawaii, working for an international retailer and pulling down a nice salary. But he wasn’t satisfied with his life chasing the brass ring. Meibos said he caught some of the “aloha spirit” and had time to reflect on his life and career path. He thought back to his college days when he was a volleyball athlete and had several teaching and coaching opportunities. He came up with a strategy: Get his master’s degree from ASU, teach in the States for a few years, then travel the world and instruct students from around the globe. As soon as he entered the master’s program at Mary Lou Fulton Teachers College, he knew he had made the right choice. Meibos graduated with a Master of Physical Education degree in 2011 at age 30. Initially he found a teaching position in China, but two weeks before he was about to leave, a job opened up at Crockett Elementary in Phoenix's Balsz School District, which serves the largest refugee population in his district and where 17 different languages are spoken. Meibos said society has marginalized many of his students and that there is hardly anyone to embrace them for who they are. But there was a time when Meibos said he felt like pulling up stakes and leaving the profession — around the three-year mark — because he didn’t feel there was much buy-in for him as a teacher. Meibos’ creativity manifests itself in many ways: He combines math and science into his physical education curriculum, and he’s big on team-building exercises, which he believes promotes empathy, confidence and good sportsmanship. He also makes his students journal about their experiences. He also created a yoga program and supported his school’s efforts in launching a mindfulness program, both of which complement each other. Meibos said the two programs have not only improved his students’ flexibility, movement and breathing, but have improved their communication with others and confidence in themselves. The state recently felt something for Meibos and honored him as the 2018 Arizona Teacher of the Year. Meibos received a $15,000 cash prize, a trip to the White House to meet President Donald Trump and a nomination for National Teacher of the Year. The 40-year-old is starting a doctorate program in organizational leadership in January. One day he hopes to train and develop future Arizona teachers. Rachel Manak wasn’t born to be a teacher, but it was awfully close. She heeded the call of teaching when her instructor made a kind gesture on the first day of school. As that year progressed, Manak found classroom learning stimulating and even took extra worksheets home to teach her younger siblings. “I was a nerd to the max,” Manak said. If Manak was a nerd, she balanced it out with a love for the outdoors and sports, having grown up in a small town in Colorado. She played high school basketball and today does trail running, mountain biking, rock climbing, hiking and yoga. She often incorporates sports-related activities into her teaching curriculum. Manak graduated from Mary Lou Fulton Teachers College with her bachelor’s degree in elementary education in 2015 and teaches STEM subjects to sixth-graders at Kyrene Centennial Middle School in Phoenix. Prior to that, she taught seventh- and eighth-grade science in the Tucson Unified School District, an eye-opening experience, she says. Manak said the job also has other challenges — like trying to get along with 60 different personalities (she teaches two shifts of classes at Kyrene) and keeping them in check. In times like those, Manak said she often relies on her MLFTC training that showed her how to engage with students personally and tap into their individuality and creativity to make learning fun. Manak does that in a variety of ways. For example, her students get to shoot a miniature basketball through a hoop if they share what they learned about graphing ratios, or she’ll create math problems individualized for students’ interests. Manak also incorporates kinesthetic activities into learning concepts. Last year she taught on the concept of plate tectonics using a game based loosely on Simon Says. Manak said a lot of her teaching methods are through trial and error, and what works one year might fall flat on its face the following year. Manak was nominated for the Rising Star Excellence in Education Award by the Tempe Diablos in her third year of teaching, the same year half of her peers leave the profession. She said she understands how teachers can get frustrated and switch careers. Manak believes it boils down to a simple equation. MLFTC alumna Angelina Cook discovered in her first year that educators don’t wear one hat but several. She said education for her boils down to one thing: helping connect the dots for her students. Now in her second year, Cook understands that patience and pacing is the key to teaching kindergartners. She said they go at their own pace, and that in addition to learning basic concepts, she also oversees their emotional, social and moral development. Cook uses an arsenal of weapons to keep their interest high, including interactive games, exercises, YouTube videos, toys, puzzles, puppets and whiteboards. Because Eagle Ridge is a 1-to-1 technology school, she also uses tablets in the classroom to enhance learning. 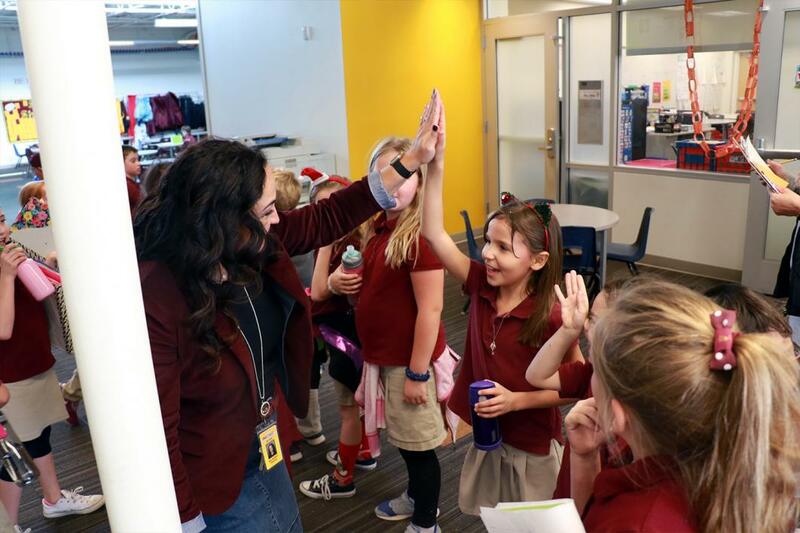 She learned that in her student teaching through the ASU iTeach AZ program, which she credits for preparing her with everything from lesson planning and classroom management to creating a supportive community around her students and their parents. She stays connected with parents through an educational app, texts, phone calls, newsletters and parent-teacher conferences. Cook is also big on professional development and asking others for advice on how to improve her teaching, including Facebook groups. And that’s exactly what Cook is doing. Recently she applied for the master’s degree program for educational policy at ASU.